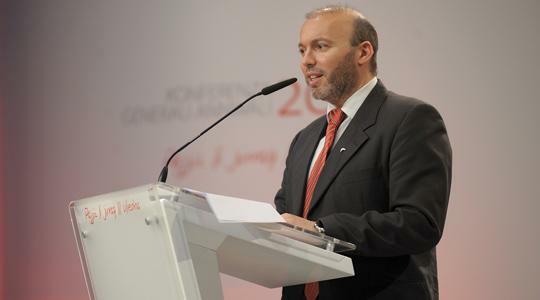 After converting to Islam many years ago, former Nationalist local councillor Mario Farrugia Borg yesterday made another conversion public as he addressed the Labour Party’s general conference. “Until a few years ago I never imagined I would do this,” he said in a heartfelt speech in which he accused the Nationalist Party of rejecting him because of his religious beliefs. He said the country had recently gone back to the poor state it was in before 1971 when former Labour leader Dom Mintoff took power and “lifted the people out of ignorance and poverty”. During the 1980s, Mr Farrugia Borg, who came from a staunchly Mintoffian background, had begun to reject Labour and, due to the political circumstances of the time, started militating within the PN. He had then been “persuaded” by the party to contest the 1998 local council elections after the general secretary had assured him that his Muslim faith would not be an issue. Although he was not elected, he was then co-opted after another Qormi local councillor resigned. “I was the first Maltese public officer to take an oath with my hand on the Koran,” he said. But things soon turned sour. Sure enough, he said, the PN did not ask him to contest the election again and he quickly began feeling distant from the party, eventually cancelling his lifelong membership. Mr Farrugia Borg said the Nationalist government had be­come unrecognisable and riddled with corruption, arrogance and broken promises. Slamming the PN as a party of “apartheid”, Mr Farrugia Borg said the Labour Party had welcomed him “gladly” and he now felt “at home” in a party which welcomed minorities. “I am proud to parade the torch,” he said, referring to a pin he wore bearing the Labour Party’s emblem.